In our #AMreport today at@WCHospital, we reviewed a case of Thrombotic Thrombocytopenic Purpura (TTP). We discussed the high-mortality rate associated with delayed diagnosis and intervention of this Thrombotic Microangiopathy. Characterized by abnormal activation of platelets and endothelial cells, deposition of fibrin in the microvasculature, and peripheral destruction of erythrocytes and platelets. Results from large multimers of Von Willebrand Factor due to congenital (Upshaw-Schulman syndrome) or acquired deficiency/inhibitor acting on ADAMTS13. 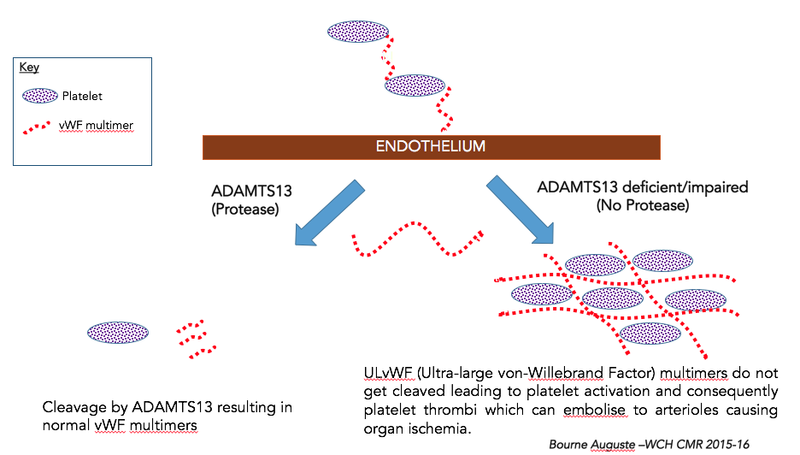 ADAMTS13 is a metalloproteinase that cleaves these large multimers (see image below). Figure 1: Simple Schematic Drawing of the Pathophysiology Behind TTP. TTP carries a high-mortality if prompt diagnosis and urgent management is not initiated. 10% of patients still die despite early therapy and intervention within the first 24 hours. If suspecting TTP, Fresh Frozen Plasma can be given until more definitive management with PLEX is available. RCTs show that PLEX to be superior to simple plasma transfusions. The classical pentad of fever, neurologic compromise, renal failure, thrombocytopenia, and hemolytic anemia is not all required to make the diagnosis and in fact is rarely seen all together at once. *Evans syndrome can also present this way but remember it is a disease of exclusion typically associated with ITP + autoimmune hemolytic anemia. Previous Case of the Week: Take a deep breath!